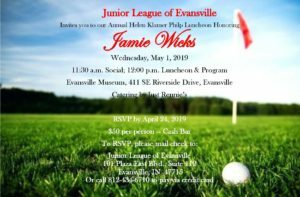 Join us in celebrating Jamie Wicks, the Junior League of Evansville’s Helen Klamer Philp 2019 Outstanding Sustainer Leadership and Volunteerism Award winner. The event is Wednesday, May 1, 2019. Social hour begins at 11:30 AM, with the luncheon and program starting at 12:00 PM. The event will take place at the Evansville Museum, 411 SE Riverside Drive, Evansville, IN. Catering by Just Rennie’s. Cost is $50.00 per person – cash bar.